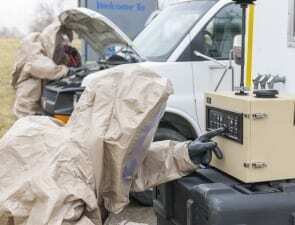 As health and policy leaders wrestle with how to respond to the deadly Ebola outbreak, a leading Battelle expert in the detection of airborne biological threats will describe the need for new biodetection technologies to homeland security and defense experts gathered at CBRNe Convergence. Matthew Shaw, vice president and general manager of CBRNE Defense at Battelle, will address the global conference today. Battelle, the world’s largest independent R&D nonprofit, has helped government agencies and industry solve some of the most complex Chemical, Biological, Radiological, Nuclear & Explosive (CBRNE) defense challenges for the past several decades. Battelle has been investing in state-of-the-art biodetection technology to enable effective detection and identification at significantly reduced operational costs as compared to current technology. Currently, Battelle is working to verify that an aerosolized version of the Ebola virus, and other infectious agents like the Enterovirus D-68, could be detected rapidly and inexpensively using this technology. “The current Ebola outbreak, as well as the Enterovirus D-68 outbreak responsible for many deaths, demonstrate the need for us to step up our public health preparedness and response protocols, as well as our detection capabilities,” Shaw said. Shaw will trace Battelle’s approach to biological hazard detection from the first Gulf War to next-generation technologies that can deploy more safely, quickly and less expensively. Battelle has a long history of helping the Department of Defense develop bioaerosol detection systems. In the 1990s, Battelle helped the U.S. Army identify and develop off-the-shelf instruments and technology for use in the manually-intensive “lab-on-a-truck” Biological Integrated Detection System (BIDS). Then, in response to the Army’s call for a reliable, automated system to detect and identify biological threats, Battelle spearheaded development of the military’s current automated biodetection system, the Joint Biological Point Detection System (JBPDS). Today, there are hundreds of these units deployed worldwide, from Navy ships to the Stryker NBCRV and the M31A2 Biological Integrated Detection System, each containing bio-suite components manufactured by Battelle. Currently, Battelle is selling its Resource Effective BioIdentification System (REBS), which is an automated, reagentless, and effective biodetection system with very low operational costs—at about $1 per day—as compared to other systems. Source: Battelle press release, adapted. Battelle is a supporting sponsor of Global Biodefense.